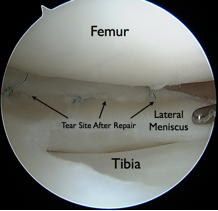 Torn Meniscus Recovery Time - Jeffrey H. Berg, M.D. What is the normal torn meniscus recovery time? It depends. Perhaps you recall from an earlier post that some who have a torn meniscus are treated without surgery while some require surgery to get better. 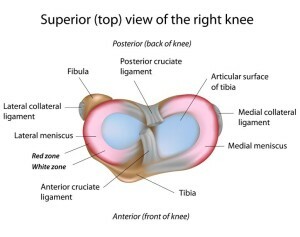 Furthermore, there are two main types of torn meniscus surgery. Each has its own length of recovery. So, depending on whether you have surgery or not and if you do, what type of surgery you have, determines the torn meniscus recovery time that you can expect. 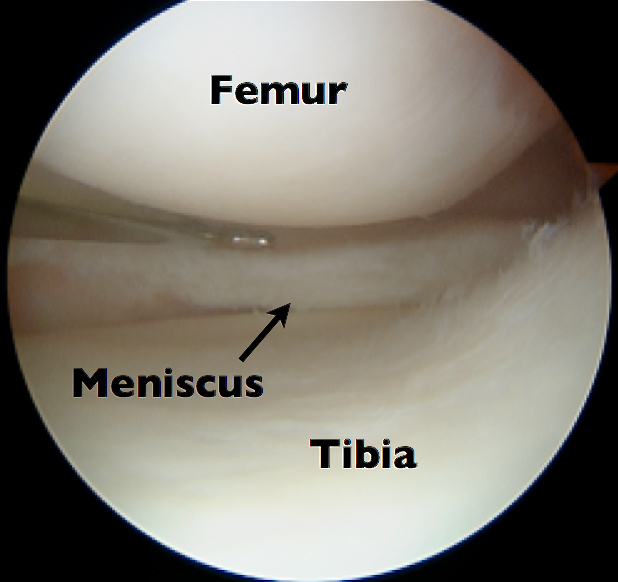 Briefly, the meniscus is a C-shaped disc that exists in your knee joint. It rests between the end of your thigh bone and the top of your shin bone. It is an important shock absorber and stabilizer of the knee. Tears in this structure can occur during athletic or everyday activities. These tears are a common source of pain, swelling and disability of the knee. In older, sedentary people, the symptoms from the tear may resolve with nonoperative care. In active people, these tears usually require surgery for the symptoms to go away. Most tears are not repairable. That is, the repaired tear is unlikely to heal after surgery. Similarly, repairing the tear won’t improve the ultimate outcome. As a result meniscectomies are much more common than meniscal repairs. Physical Therapy, to correct any weakness or dysfunction that can arise from the initial problem. With this treatment, you should hopefully see an improvement in your symptoms within 4-6 weeks. It may take even more time to fully recover. When maximum recovery may occur is debatable. Experience suggests that a trial of at least 3 months is not unreasonable before abandoning this approach. Meniscectomy is the more common of the two meniscal surgeries. It is quick, usually without much post op pain or disability and it is typically very reliable at relieving pain and restoring function. Because tissue has been removed rather than repaired, the knee doesn’t have to be protected as much postoperatively as if a repair was performed. As a result, you can commonly weight-bear on the surgical leg immediately. In fact, after this type of surgery, you will typically be able to progress activities as able with limits only determined by your symptoms (and your surgeon). Usually improvement from preoperative symptoms should be noticed 2-6 weeks after surgery. However, it is not uncommon to have some symptoms (pain, swelling) with increased activities for even up to 3-4 months. Physical therapy may hasten your recovery. Advanced age, coexisting arthritis in the surgical knee and having had additional procedures performed to your knee during the meniscectomy, can all prolong the recovery. During a meniscal repair, sutures are used to close the tear site and hold the edges of the tear or the meniscus and the tissue that it tore from together until it heals. This healing takes time. During that time, the sutures could break and if the tear is not yet healed, the repair would then fall apart. For this reason, after this type of surgery, while the tear heals, your activities and motion will often be restricted. It is not uncommon for a brace to be used for the first several weeks. Similarly, your surgeon may suggest limiting how much weight you can put on the surgical leg. Limits on how deeply you can bend your knee may also be advised. These restrictions protect the repair and may promote better tear healing but they also may lead to weakness, stiffness and prolonged swelling. As a result, when the meniscus is repaired, the torn meniscus recovery time is usually much longer than when the tear is removed. Although, the preoperative pain may improve in several weeks, it will take much longer for optimal function to be achieved. Typically, I do not allow jogging for 3 months and agility exercises for 4-5 months. After this type of surgery, many won’t return to full activities for about 6 months. Not all meniscus tears are treated the same. 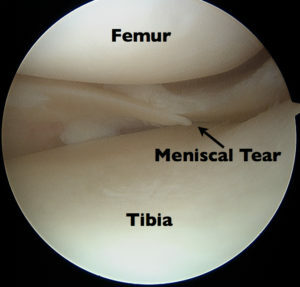 Torn meniscus recovery time varies based on the way your meniscus is treated. Usually you can expect improvement in your symptoms within several weeks. However, it can take months until all your symptoms resolve.